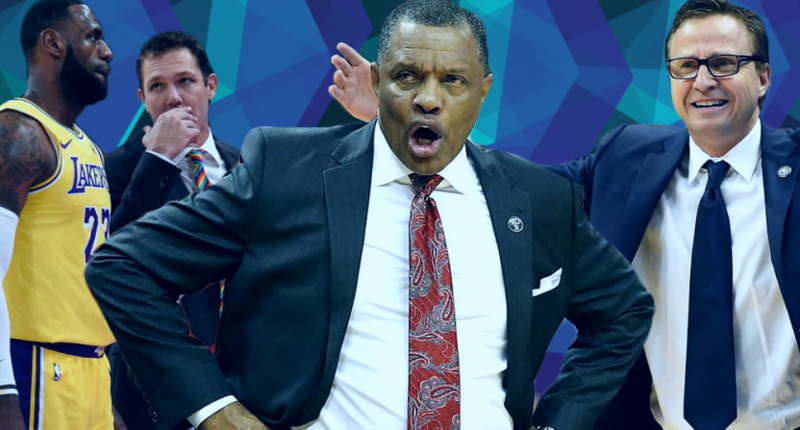 Alvin Gentry, Luke Walton, and Scott Brooks are among coaches feeling the heat. Three teams have already decided to make coaching changes this season. The Cleveland Cavaliers fired Ty Lue and replaced him with Larry Drew. The Chicago Bulls dumped Fred Hoiberg and promoted Jim Boylen. Most recently, the Minnesota Timberwolves axed Tom Thibodeau and named Ryan Saunders head coach. They likely won’t be the last. Here are five more coaches currently on the hot seat. After finally firing Randy Wittman, Washington gave Brooks a reported five-year, $35 million deal to take over a squad featuring a dynamic John Wall/Bradley Beal backcourt. The Wizards were built to challenge for the top team in the East, yet before Brooks arrived they couldn’t make it out of the Conference Semifinals. In three years with Brooks behind the bench, not much has changed. Washington made the playoffs in Brooks’ first two seasons, but in year three the Wizards sit 10th in the East with a 21-28 record. Wall, fresh off signing a max deal, is out the rest of the year due to injury. Bradley Beal is being shopped while playing the best basketball of his career in Wall’s absence. Barring a tremendous second-half performance, the Wizards will finish in the bottom of the East. Washington’s roster is old, lacks dynamic young talent, and is expensive – meaning they’re on the path to rebuilding. Brooks was brought in to win. The Wizards aren’t built for that. More importantly, the culture hasn’t changed at all during his tenure. Moving on from Brooks would make sense. Luke Walton was given the tall order of trying to win-now with the addition of Lebron, while simultaneously developing younger players. So far, Walton’s done an admirable job, leading the Lakers to a winning record despite a plethora of injuries. However, there’s one big problem: James reportedly wants him gone. ESPN’s Brian Windhorst and Jackie MacMullan reported LeBron’s camp “would like a coaching change.” That’s not great news for Walton, as James pulled a similar tactic in his first season back in Cleveland with David Blatt. LeBron has more sway than any player in the league, and if team president Magic Johnson had to choose between the coach and LeBron, he’s picking LeBron every time. It’s a shame because Walton’s done a nice job. The Lakers are in the hunt for the postseason with a weirdly equipped roster. GM Rob Pelinka didn’t do Walton any favors bringing in Rajon Rondo, Lance Stephenson, and Michael Beasley. Is Walton a great coach? I don’t think there’s enough evidence to suggest that. But he’s in a tough spot here, and he probably doesn’t deserve to get fired. In his fourth season in New Orleans, the Pelicans are imploding. They’re near the basement of the West, and the doomsday scenario has arrived: Anthony Davis wants out. There’s something to be said about general manager Dell Demps mismanagement, but Gentry’s coached one of the NBA’s five best players and only managed one (second-round) playoff appearance. With the Pelicans on the verge of selling their roster off to the highest bidders, it might be time for a new voice. Once Davis is traded and other pieces (Nikola Mirotic, Jrue Holiday) are moved for future assets, it would be logical to fire Gentry and rebuild with a new coaching staff and front office. Back when the Cavaliers fired coach Ty Lue, there was some weird drama with contract negotiations involving Drew. The then-assistant coach reportedly wanted more guaranteed money to run the Cavs, and eventually, GM Koby Altman relented, giving Drew the head coaching job. Cleveland’s managed a 10-36 record under Drew, who to be fair, doesn’t have much to work with. With franchise-icon LeBron James departure and power forward Kevin Love appearing in just four games in 2018-19, the Cavs are stuck with a series of role players starting as the team chases the bottom of the standings in hopes of landing the number one pick in the 2019 draft. Drew’s been OK as head coach. But, he’s done nothing to show he deserves the gig past this season. If Cleveland lands a top-three pick as expected, the Cavaliers would be best suited to bring in a new coach and usher in a new team entirely. Drew saw this coming, which is why he negotiated that bump in the first place, so it’s not exactly a surprise. The Sacramento Kings have their young talent playing great basketball, are fun to watch for the first time in forever, and might be a playoff team for the first time since the 2005-2006 season. So, naturally, internal drama might sink all the positive momentum the Kings have experienced under Joerger. Yahoo Sports reported back in November, the Kings could part ways with Joerger over “philosophical differences” regarding playing time for the team’s young players. General manager Vlade Divac denied the report, publicly stating Joerger has his full confidence, but this is the Kings we’re talking about. Sacramento’s in the best shape it’s been as a franchise in a very long time. It would be fitting considering the recent history that ownership might blow it.